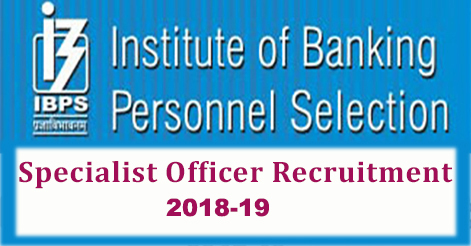 Institute of Banking Personnel (IBPS) has released an advertisement for the recruitment of Specialist Officers (SO) under the Common Recruitment Process (CRP SPL-VIII) in various participating organizations from all over India. Total No. of Post is 1599. IBPS invites eligible candidates for the recruitment of Specialist Officer (SO). Candidates can apply online from 06 Nov to 26 Nov 2018. Rajbhasha Adhikari (Scale I) Post Graduate Degree in Hindi with English as a subject at the degree (graduation) level OR Post graduate degree in Sanskrit with English and Hindi as subjects at the degree (graduation) level. The selection of candidates will be on the basis of Prelim, Mains Examination conducted by IBPS. Qualifying students will further be called for the interview. After which final selection will be declared. Note: Candidates have to qualify in each of the three tests by securing min. cut-off marks to be decided by IBPS. Interview: Candidates who have been shortlisted in the Online Main Examination for CRP SPL-VIII will subsequently be called for an Interview. Candidates are required to register themselves online through official website www.ibps.in from 06th Nov to 26th Nov 2018. No other means/mode of application will be accepted. After registration candidates are required to pay the requisite application fee through online mode. Candidates are required to upload their Photograph (4.5 cm x 3.5 cm), Signature, and Left Thumb Impression & A handwritten declaration. Help us to improve this article/job posting "1599 IBPS Specialist Officer Recruitment 2018". We would be glad if you can comment below and provide your valuable suggestions and feedback. If this page have any wrong information/list or out of context content, then you can report us as well.